It seems like just about everyone is getting the flu this year! 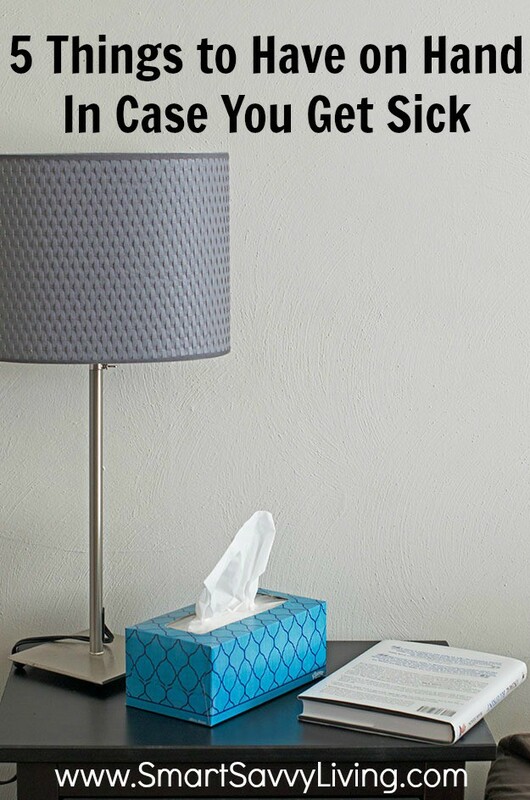 You’ll want to check out these 5 things to have on hand in case you get sick so that’s one less thing you’ll need to worry about. Recently I posted an article with 11 ways to avoid getting a cold or the flu, but sometimes no matter how hard you try, you still get sick. One of the worst things to have to do when you get sick is to brave the outdoors to stock up on supplies. So, we decided to put together this list of 5 things to have on hand in case you get sick. 1. Easy to eat foods and drinks. When we’re sick, we usually don’t feel like eating much, but it can be important to get better as quickly as possible. Keep easy to eat foods on hand like bone broth or stock (soothing and super nutritious! ), gelatins, crackers, noodles, applesauce, etc. Also have things like water, orange juice (great vitamin C kick), and sports drinks to keep you well hydrated. 2. Tea and honey. Having a sore throat is no fun, but warm tea sweetened with honey can be very soothing. The warmth and steam from the tea can also help with congested lungs and sinuses. Peppermint tea always hits the spot for me when under the weather. 3. Entertainment items that don’t take a lot of energy. Most of us try to stay home when we’re sick, especially so we don’t infect others. Have plenty of entertainment items around for yourself and the kids that don’t take a lot of energy. Some ideas are books, magazines, tablet games, movies and the like. 4. A warm cozy blanket, comfy pillow and tissues. Whether it’s relaxing on the couch watching TV or taking lots of naps in bed, we all know to take plenty of time to rest and recuperate when we’re sick. Make yourself as comfortable as possible with a warm cozy blanket(s), and comfy pillows. Just make sure to wash them once you’re feeling better so the germs don’t linger! Make sure you have plenty of facial tissues on hand, too. I love getting the ones with lotion so my nose doesn’t get super irritated. 5. Medications to help alleviate your symptoms. There are so many medications out there these days to help fight cold and flu symptoms, but it’s important to get the ones that actually work for your symptoms. One of the things I hate most about colds and flu, hand down, are sore throats. Not only does the constant scratchiness drive me nuts, but I also hate how it can hurt to talk and the burning when you try to eat or drink anything. Ugh. 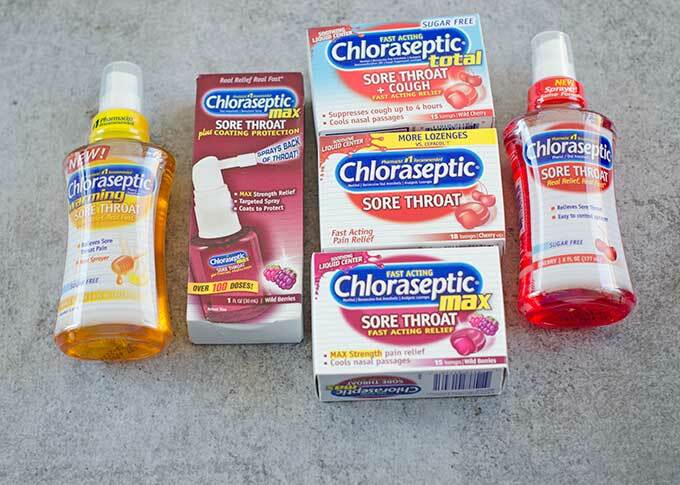 That’s why we keep Chloraseptic® products in our medicine cabinet. 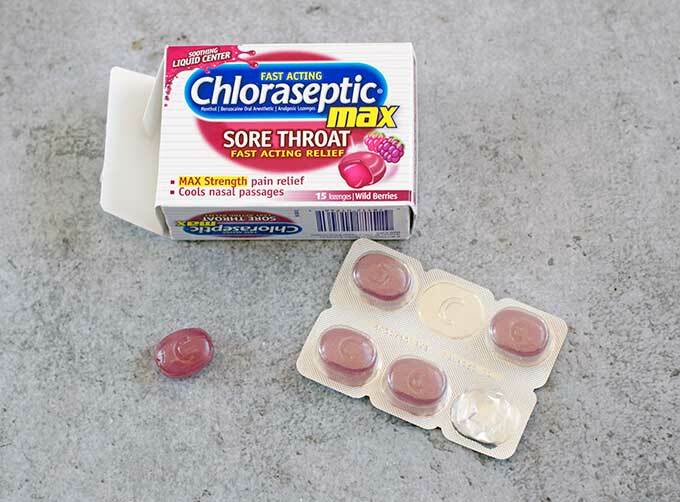 Chloraseptic® is the #1 pharmacist recommended sore throat relief brand*, after all. (*Lozenges Tied for #1) Whether you like to apply a quick spray or or have the soothing effect from a lozenge, Chloraseptic® has a variety of flavors like berry, cherry and honey to choose from. My personal favorite are the cherry lozenges as I like that they are fast acting, and have the awesome liquid center that really soothes. 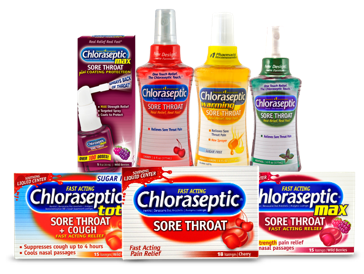 Want to try the awesomeness of Chloraseptic® yourself? Grab this $1 Chloraseptic® Coupon and check out the Cold & Flu Tracker and the Chloraseptic® Facebook page where you can find great DIY ideas and funny posts to help you get through the week whether you’re sick or not. Do you have these 5 Things to Have on Hand In Case You Get Sick?